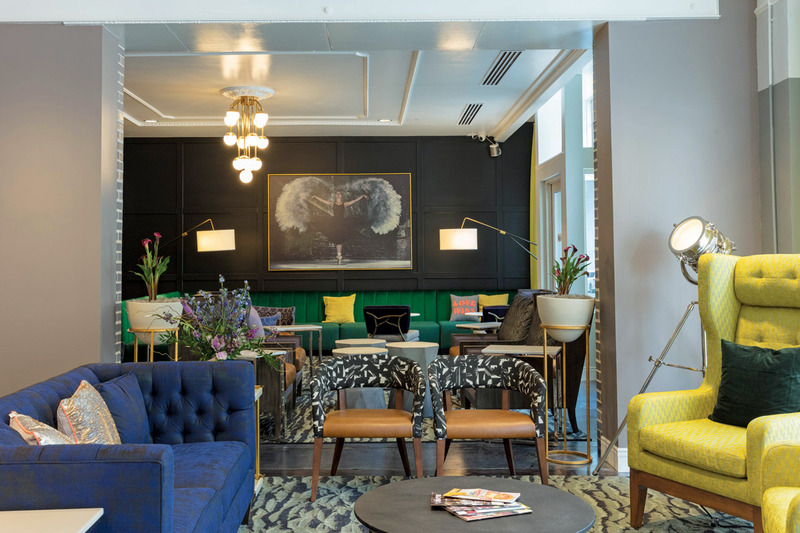 When Rita Patel and her husband, Marcus Munse, decided to open a boutique hotel in their hometown of Columbia, they knew they wanted to bring something different, unexpected, even magical to the city’s traditional lodging scene. At the same time, they were committed to creating a property rooted in the life of the city and reflective of the community’s talents. And their selection of a unicorn—a creature at once fantastic and familiar—as the hotel mascot and logo underscored their twinned (and, some might say, unreal) aspirations. 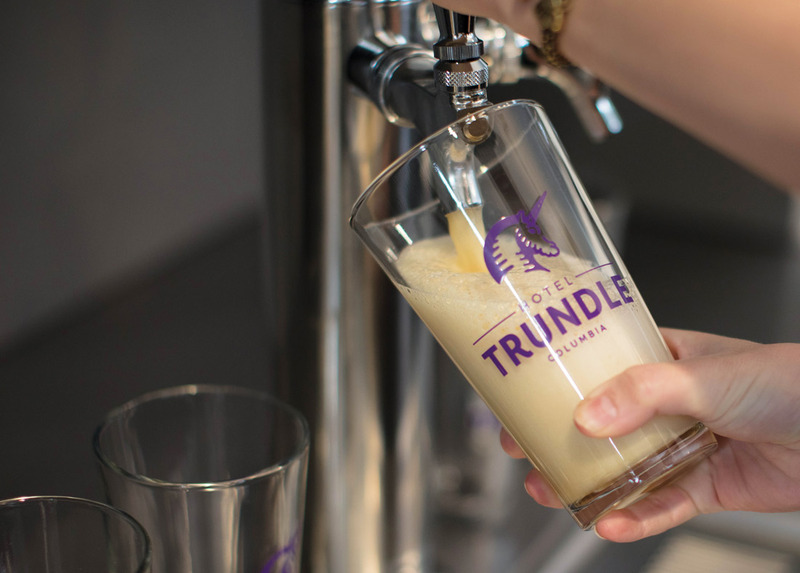 But dreams do come true, at least for this pair of young hoteliers: On April 9, National Unicorn Day, the couple cut the ribbon on Hotel Trundle. 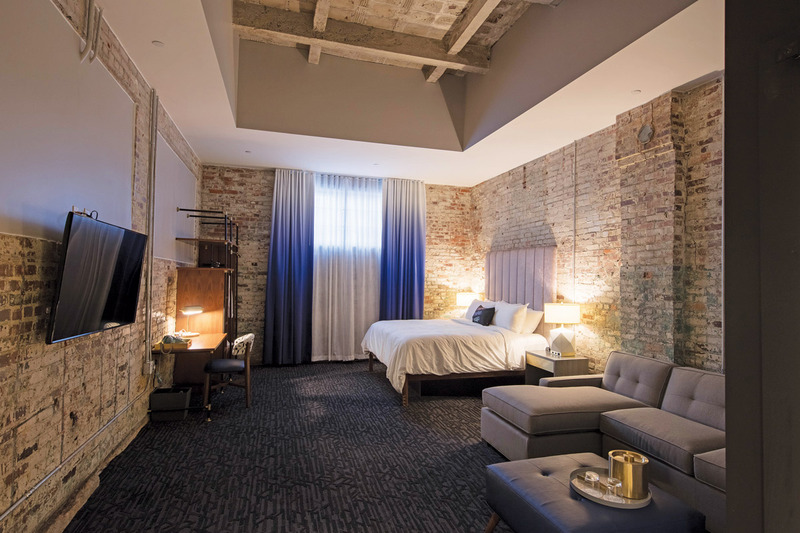 Occupying three historic commercial buildings dating to the early 1900s, the forty-one-room inn preserves many original details, from exposed brick to pressed-tin ceiling tiles. These elements provide the backdrop for a design scheme that is anything but aged. The spacious, light-filled lobby, painted shimmering silver and rich purple, features a mash-up of styles. Art Deco elements and midcentury-modern furniture with updated upholstery (think Great Gatsby meets Jonathan Adler) come together to create a space that is hip but homey. The young and playful spirit is carried into the hallways, which are hung with original photography featuring Lego people “visiting” local attractions. The wallpaper displays how-to schematics of hand-puppetry; strategically lit blank spaces serve as practice areas. The sense of fun also extends to the front sidewalk, where machines send thousands of bubbles into the streets of downtown Columbia. With a day of play behind you and a bed built for a night of deep sleep and the dreaming of dreams, you might be inclined to tuck in early. But chances are the kid in you will be begging to stay up late and make the most of your time at this wonder-filled inn. Experience more of Columbia’s creative culture at Soda City, just steps from the hotel. The Main Street market fills four city blocks, from the South Carolina State House to Taylor Street, every Saturday morning, year-round. Grab a Belgian waffle or cup of kombucha and check out performances by flamenco dancers and string quartets. Browse the booths for an antique lamp, a basket of fresh produce (or hydroponic herbs), maybe even a pet rabbit.